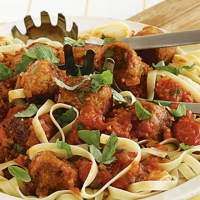 Polpettine is Italian for tiny meatballs, but this quick and easy version is made with tuna. To make the cherry tomato sauce, heat 1 tablespoon of the olive oil in a saucepan and add the onion and garlic. Fry gently for 3-4 minutes, until the onion has softened and is translucent. Stir in the cherry tomatoes and sugar, and season with freshly ground black pepper. Simmer for 15-20 minutes, until the sauce is thickened and glossy. Add half the basil and keep the sauce warm over a gentle heat. Meanwhile, place the tuna, breadcrumbs, Parmigiano Reggiano, salad onion and egg together in a large bowl and use a fork to combine. Using your hands, shape the mixture into about 16 balls, each one roughly the size of a walnut. Heat the remaining oil in a large non-stick frying pan and fry the tuna balls for 3-4 minutes, turning occasionally, until they are crisp and golden. Drain on kitchen paper before placing on top of a dish of pasta, such as tagliatelle, or rice. Pour the cherry tomato sauce over, garnish with the remaining basil and serve immediately. The polpettine and sauce can be prepared in advance and chilled. Reheat in the oven at 200°C, gas mark 6 for 20-30 minutes until piping hot.